While Ordinary Beast is her first full-length collection, Nicole Sealey’s individual poems are widely published in such distinguished venues as The New Yorker and The American Poetry Review. She is executive director of Cave Canem Foundation. In this volume, Sealey, in her breezy, formal-verging-on-experimental style, tackles an eclectic mix of themes and subject matters ranging from childlessness to racially influenced social patterns; from a wildly imaginative version of the board game, Clue; to a series of interspersed monologues for the African American transgenders and female impersonators who starred in the iconic documentary film, Paris Is Burning (1991). 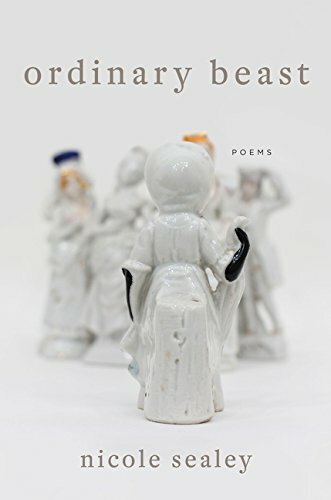 Sealey’s dizzyingly addictive spectacle of subject matters is rendered in a complex assortment of free-verse lyrics, sonnets (sometimes nonce, sometimes traditional), a double sestina, an extended cento, and at least one form Sealey claims as her own: the obverse. Given this impressive accumulation of variables, how to find a predominant theme? Easy: Sealey focuses on made things, on art and the artifice that construct it, on mannequins and performers remaking themselves, on paintings and poems and souvenirs, on the individual human being who, through reworking the elements of this world, self-transmogrify into minor species of creator-god. “a violence,” for example, discusses the infant the poet might have had, should she have had “. . . a maternal bone,/.” Such a bone would have been hidden away “. . . inside a barren nesting doll/you’ve had since you were a child . . .,” the entire act of bearing and birthing being subsumed in this instance by an artifact. “Can you see them hanging? . . .” she muses, setting the stage for the obverse’s volta, or turn, in the next stanza, where the poem inverts and repeats backwards in every element but the final line: “Who can see this and not see lynchings?/” In this case, the candelabra (the made thing) with its mannequins becomes a racialized symbology of death, no less real for its being a carefully wrought artifact standing in as metaphor. In the poem, “the first person who will live to be one hundred and fifty years old has already been born,” Sealey recalls finding herself in the same room as the Mona Lisa which “. . . was encased in glass . . . ,” the separational qualities of which Sealey compares to human skin, conflating the art piece with the human organism. In the poem, “in igboland,” after a plague of locusts has ravaged the area, residents build a mansion of dirt and clay, decorate it with bone china and statues, and then proceed to burn down as much of the structure as possible, destroying the work of their hands to appease the greater gods. “. . . I want/to learn how to make something/holy, then walk away . . .” writes Sealey, the ability to walk away from the destruction of our own artifacts becoming at once terrifying and god-like. In the sonnet, “legendary,” Pepper Labeija, a female impersonator, observes, “Outside these walls I may be irrelevant,/but here I’m the Old and the New Testament./” Artifice, if just for a performance, triumphs over nature, Pepper’s transformational skill and imagination verging on a religious gift. The extended “cento for the night i said, ‘i love you’” occupies several pages towards the center of the book. Given that a cento is a poem completely comprised of lines from other poets’ poems, such a selection is a perfect paean to the concept of artifice—all those disconnected lines carefully sought out and pieced together to form a coherent whole with a new and previously unintended meaning. The hilarious double sestina, “clue,” with the complex word repetition patterns characteristic of the sestina, is based on the murder-mystery board game of the same name. This tour de force treatment is continued in the very next poem, “c ue,” an erasure version continuing the story the double sestina began. Nothing is as artfully designed as a good murder mystery—unless, of course, it’s a good sestina. Here the bemused reader finds both under the same roof. Nicole Sealey clearly has the potential of becoming a breakthrough poet through the aegis of her insights and talents, her passionate enthusiasms, her incisive formal stance, and her unflinching aesthetic. Her commitment to a more inclusive and congealing world is evident. Sealey’s passions radiate and radiate through these poems. They are unleashed.